On the brunch occasion in question I tried making a breakfast style sausage out of lentils and seitan, but the result was incredibly dry and gritty. Luckily, my husband make his famous deep dish pancake that day, so a good brunch was had by all. And to be real, there’s not much room for sausage when you’ve dining on a massive eight-serving pancake. Anyhow, I kept at it with the vegan sausage recipe, mostly because I recognized a need for such a thing as an ingredient in lots of my other recipes. I think at this point I’ve probably suggested using store-bought vegan sausage in at least a few recipes on this blog, and while I think there are some decent brands out there, I recognize a couple of things: (1) depending on where you live, your supermarkets might not sell these products, and they aren’t exactly Amazon-friendly (the two potentially hard to find ingredients in this recipe are), and also (2) isn’t it just all kinds of fun to make stuff yourself?! If you’re me it is. I realized that the trouble I was having with my previous batches of veggie sausage was in the ratio of wheat gluten to liquid. There’s quite a delicate balance going on here, and what I finally ended up doing was working an adaptation from Isa Chandra’s Italian Sausage Recipe. You’ll need some vital wheat gluten to get started. What’s this you ask? 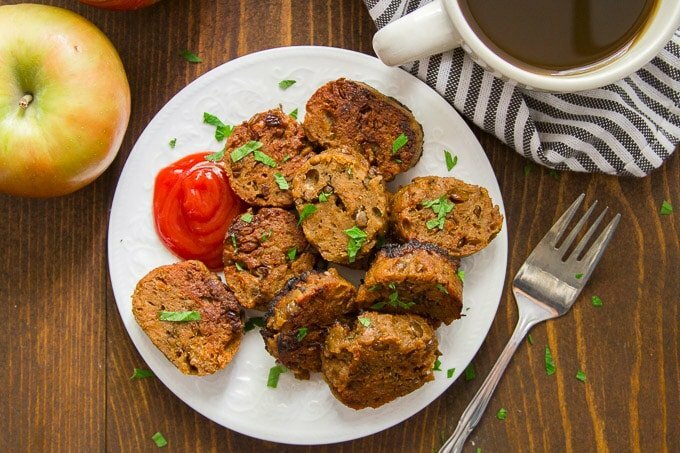 It’s the protein that’s found in wheat, and it’s what seitan is made from. (Learn more about that here.) You can find vital wheat gluten in powdered form at places like Whole Foods, or you can buy it online. Add some spices, cooked lentils, and a seasoned broth. 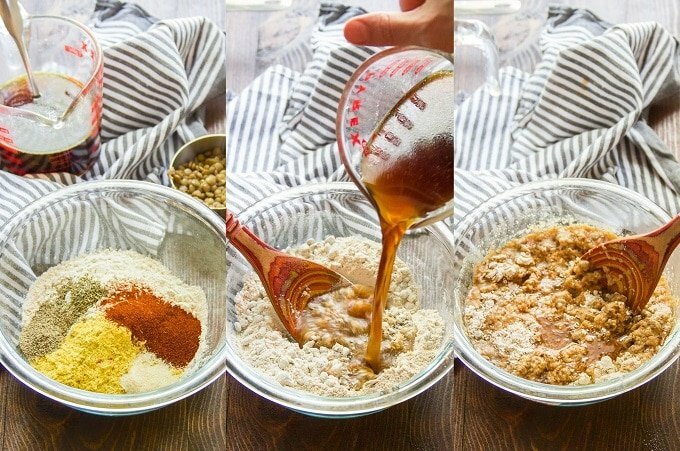 Mix everything up to form a dough. 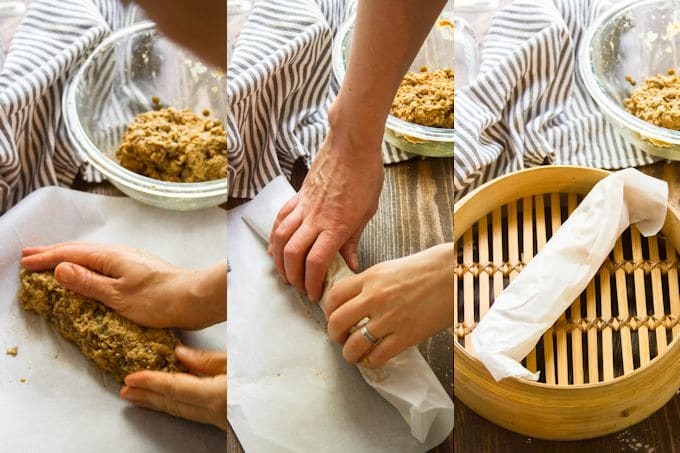 Shape your dough into a log and place it on a sheet of parchment paper or foil. Roll it up tight! Next you’re going to steam it. I used a bamboo steamer, which worked great! But any steaming device that’ll fit your logs will work. If you’ve got something small like a metal steaming basket, you’ll just need to make smaller logs and perhaps steam them in batches. Once the steaming is done, slice the logs into patties and pan fry until crisp. You’re probably going to have a few lentils fall out of your dough when you shape it into logs. Just a warning! It’s totally normal. The sausage is freezer friendly! I like to freeze the patties before pan-frying them, and but after works too. Is there a way to make this sausage gluten-free? Unfortunately, not that I know of, since wheat gluten is the main ingredient. 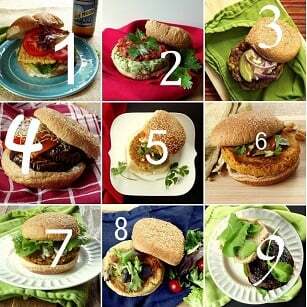 The tempeh patties used in these sandwiches have a very similar flavor profile though. Is there much difference in using parchment paper vs. foil? I find the foil easier to roll, but the patties made with parchment paper came out sturdier and had a denser texture. 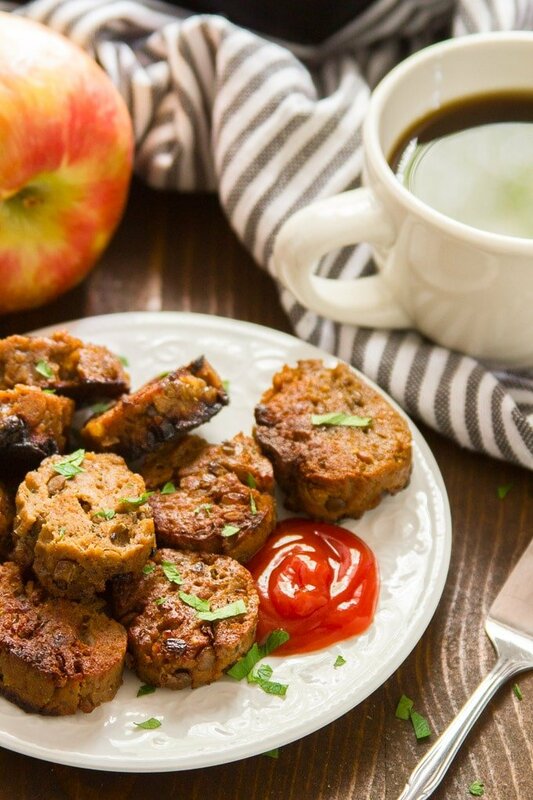 These totally vegan seitan sausage patties are made with hearty lentils and flavorful spices. 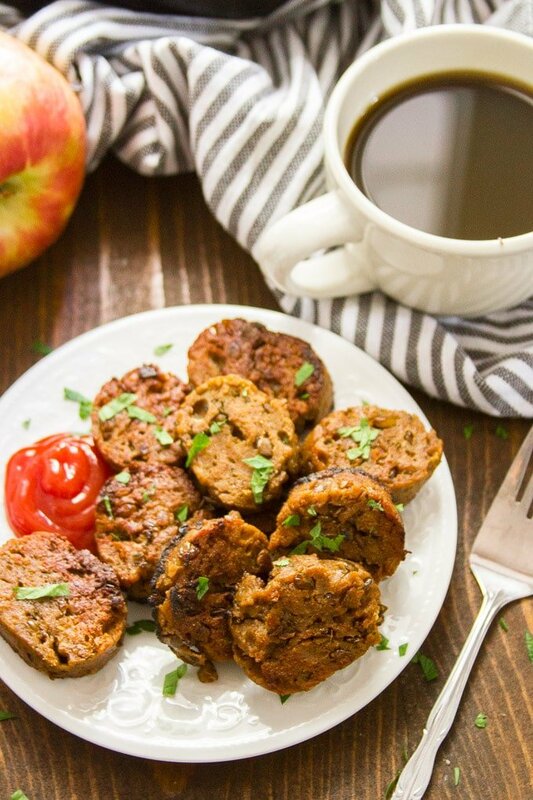 The perfect savory accompaniment to your vegan breakfast! Begin by setting up a steaming apparatus, such as a wok and bamboo steamer or a pot fitted with a steaming basket (see my tips above). In a medium mixing bowl, stir together the wheat gluten, nutritional yeast, paprika, pepper, onion powder and thyme. Stir the broth, soy sauce, maple syrup and garlic together in a separate bowl or liquid measuring cup. Add the lentils to the dry mixture, then stir in the broth mixture to form a dough. Mix it up well, using your hands if needed. Divide the dough in two and roll into two 6" logs. Wrap each log tightly in a sheet of parchment paper or foil and steam for 30 minutes. Remove the logs from the steamer and give them a few minutes to cool. Once they're cool enough to handle, remove the parchment paper or foil and slice the logs into about 1/2 inch thick slices (or your preferred thickness). When the oil is hot, add the sausage slices and pan-fry for about 4 minutes on each side. Cook in batches if needed. 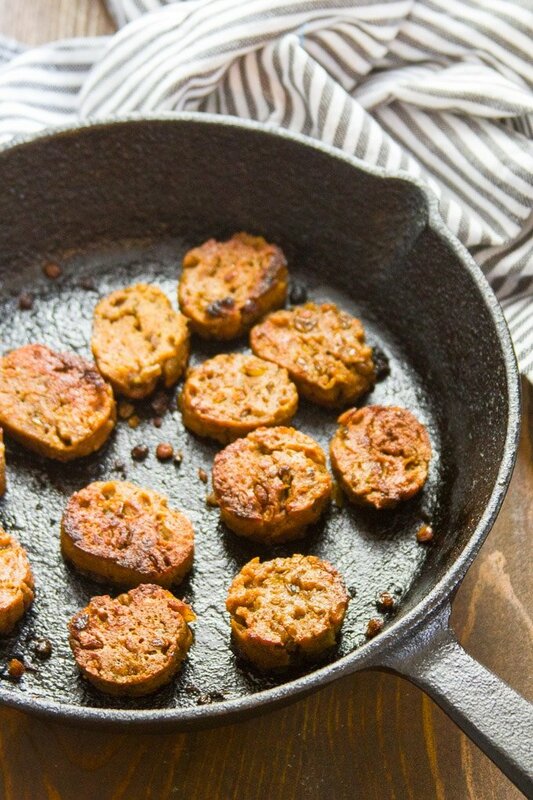 Transfer the cooked sausage patties to a paper towel-lined plate. I made this recipe and it is, BY FAR, the best seitan dish I’ve ever made! Thank you so much! I’ve tried the PPK recipe, and I’ve found my seitan turned out really underwhelming and not tasty at all. Your recipe (I did add a touch more vital wheat gluten, however) turned out so delicious and had a perfect, appetizing texture. I don’t have a bamboo steamer, so I just used a large pot and a steaming basket instead. Again, thank you! 1st attempt I was really pleased but the recipe calls for way too much pepper. Next time I will half the amount, it dominated the taste too much for my taste buds. Hi! Do you have any baking instructions/suggestions for this seitan recipe? Looks delicious! I chopped some of it up, mixed with frozen corn, and sprinkled with taco seasoning mix then heated in the microwave. It made a very yummy filling for street tacos and dinner was on the table in less than 10 minutes! Great idea and sounds like a delicious meal! I’m glad you enjoyed it! I tried an approximation of this recipe (same gluten to water ratio) in the oven, baked in a bread pan for 45 min at 350 and it worked pretty well. It was softer in the center but baking slightly longer or pan frying slices afterwards fixed the softer parts. I make these all the time!! They’re delicious. Even meat eaters love them! Thank you for sharing the recipe. Awesome!! I’m so glad they’re a hit! Thanks Zoe! 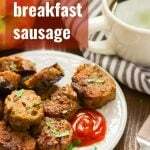 Two questions…could I add additional spices (fennel and sage) to give it more of a breakfast sausage flavor? Second, I’ve love to make sausage rolls. If I use this recipe would I have to steam them first or just roll a log in puff pastry and bake it off? You can absolutely switch up the spices! And I’d recommend steaming them first. I think they might end up a bit dry if you don’t. I hope you enjoy them!! Trying these today…..wait for news. Will be used for the third birthday breakfast of my Grandson. Ok, made the sausages. Used foil and my bamboo steamer Now,interestingly. Enough…I love salt and really different food, cook many cuisines. I found these to be perfect but TOO salty with a vey strong taste???? My daughter the VEGAN said she thought the smoked paprika was too strong, did not find them salty, she has basically a salt free diet…Go figure. I shall try these again using half the amount of Soy Sauce (I used Tamari) with water. Also will add some different spices, perhaps sage (which is a herb), and cumin. Over all, I am thrilled with the concept as I have not eaten a sausage in about fifty yeas so this would be a boon to my breakfast. One can only eat so much Oatmeal. Thanks so much for this recipe and permitting my comments. YUM!! I had convert the measurements to the Metric system, so I was hoping I wasn’t too far off. My mix was really wet – I could wring it out but I kept going. Steamed them two at a time, then did a test pan fry to know if they’d worked. O. M. G.
The resident meat eater and vego/vegan sceptic ate most of my test batch! He loved them! So did I, as did my children! It was my first time making seitan, and while the flavours were pretty intense (could be converting the measurements), I loved the result. Fast, easy to make and tasty. Win! Yay!! I’m so glad you enjoyed them! Thanks Carly! Do you think oats would work as a substitute for the wheat gluten? Please reply soon, want to make these this week :) ! Hi Christine! I haven’t tried, but I don’t think you’d get the same texture or be able to get the sausage to hold together with oats. You might be able to get it to work with some other changes to the recipe (maybe add beans? ), but I couldn’t tell you what to do without some experimentation. This sounds like a great recipe from the responses im reading. Does the recipe call for canned lentils or do they have to be the dried type, if so im assuming rhey would have to be cooked and mot used raw. Hi Tracy! You can use cooked or canned lentils – both work! Just don’t use dried lentils, and make sure if you use cooked that you measure them after cooking and not before. Enjoy! !